The Dog Bag pet carrier is an exciting and intelligent concept in dog transport, protection and care. 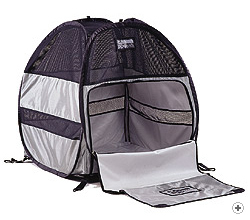 A lightweight but super-strong 'pop up' fabric kennel which offers significant advantages over the traditional steel cage. Dog Bag uses integrated sprung steel loops to provide structure and stability, it packs into a small rucksack - small enough to hang inside on a coat hook, or to keep in the car. Compare this convenience to standard 'collapsible' cages and carriers which at best are about as handy to carry as deck chairs! You can clip your Dog Bag pet carrier to the tie down loops in the car boot, or strap it to the car seat using the special seat belts provided. You can also lift the tailgate or open the doors without worrying about the dog escaping - you won't even need a dog guard. The Extra Small Dog Bag is also particularly suitable for cats especially when used together with the Carry Set accessory. Dogs appreciate the comfort, warmth and privacy offered by the thick fabric sides, strong enough to lean or lie against. The band of mesh fabric at eye level allows the dog to see what's happening without having to sit up, and the top mesh band which provides excellent visibility when sitting or standing, as well as reducing harmful UV radiation. Dog Bag provides an appropriate combination of strength, privacy and air circulation. The Large, Medium and Small Dog Bag pet carriers are usually fixed into the car boot, but the Medium and Small models are also supplied with seat belts for fixing to the rear seat - especially appropriate for saloon car drivers. If the Dog Bag is wider than the rear seat you should consider buying a Foot-well Filler accessory; you'll need to decide whether there is any risk of the dog, in its Dog Bag, sagging into the foot well. The Extra Small model is really only designed for fitting onto a car seat - special seat belts are provided. If the design of the Small Dog Bag is more suitable for your needs than the Extra Small, then of course there's no reason why you shouldn't use this size instead! Visit the Folding page to learn about putting the Dog Bag back in it's rucksack.